I tried making my own scratchboards, painting masonite with plaster-loaded gesso, then with gel medium darkened with india ink. The result was an impenetrable surface. And so "gougeboard" was invented. Being a good sport, not one to let failure deter, I commenced to gouge, scrape, smear, rub and generally work the surface until I'd had enough. 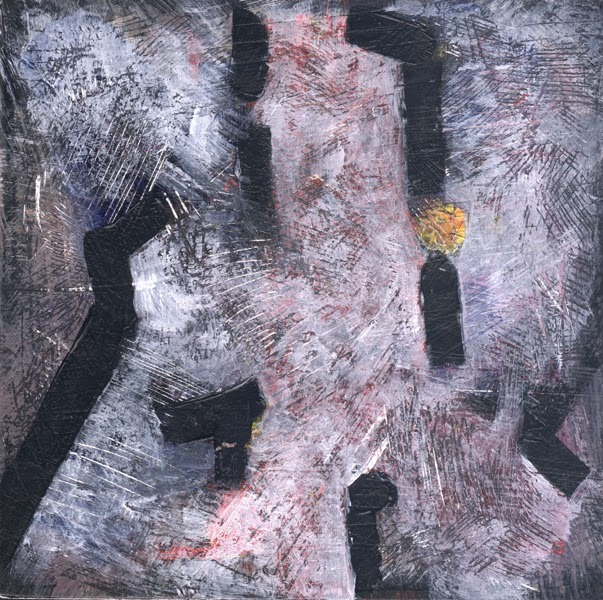 The result are seven confused-looking abstract panels, children of these dark winter days. This is a 6" x 6" sheet of masonite, painted with acrylic. It is number one in a series of seven.